The ChessBase website has a very interesting article you have to see to believe. It's a segment titled, "The King's Odyssey: Murder English Style" and it recounts a number of games in which the King take a frolic up the board as an attacking piece! Mind you… the board is fully populated in these cases and serves to bring light of the fact that the King's attacking power is not limited to the endgame. Two of the games were by the magnificent British player, GM Nigel Short. In both games, he marched his king all the way up the board to launch a mating attack. One of these opponents was no less than then-World Champion GM Garry Kasparov (London, 1987). Another famous opponent getting crushed by a GM Short "King Hunt" was GM Jan Timman (Tilburg, 1991). In the diagram on the right, Short's king marched from g1-h2-g3-f4 and then 34.Kg5!! and Timman resigned in lieu of 34…Kh7 (34...Bxd7 35.Kh6! and mate next move) 35.Qxg6+ Kh8 36.Qh6+ Kg8 37.Kf6! These are games are certainly instructive, but we understand that player discretion is advised when trying these King mating attacks! In the September 2002 Chess Life magazine, award-winning journalist GM Andy Soltis presents an interesting game (Hamppe-Meitner, Vienna 1872) that showed a frolicking King, but under different circumstances. 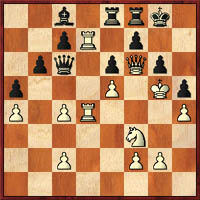 In this case, the white King was drawn out by the Black queen and ended up on the c6-square!! You'll have to get your copy of Chess Life to see GM Soltis' lively annotations, but at least you can view the game by visiting the link below. See ChessBase's "The King's Odyssey: Murder English Style"